In the Ledenburg Collection, we have found four previously entirely unknown concertos for viola da gamba and strings that date from the second half of the eighteenth century and are obliged to the early Classical, gallant style. 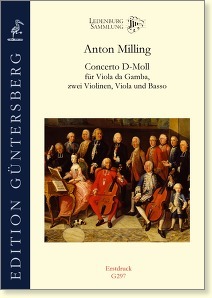 This concerto by Anton Milling is one of them. We know very little about the composer, although two English-horn concertos by him are in the holdings of the Fürst Thurn und Taxis Hofbibliothek in Regensburg. There are only a very few viola da gamba concertos. Only the concertos by Telemann, J. G. Graun, Pfeiffer, and Tartini were known until now, and we are aware of several others that have not been preserved. The Milling concerto is therefore a welcome addition to the repertoire. It is attractive, yet considerably shorter and easier to play than, for example, the viola da gamba concertos by Graun. The Ledenburg Collection in Osnabrück was discovered only in 2015. For the most part, it is made up of viola da gamba music of the early Classical era. 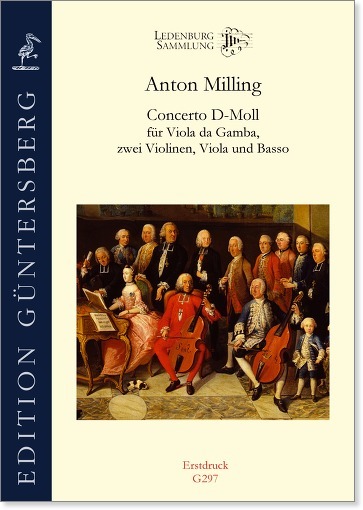 Of particular importance in this collection, however, is a print from 1735 that contains the twelve Fantasias for viola da gamba solo by Georg Philipp Telemann, which were previously thought to have been lost. The Works for Viola da Gamba in the Ledenburg Collection.